Summer is the time for berries. The English are correct in saying that the best way to eat fresh berries is with cream. So that is what we have done with these Berry Parfaits. Fresh berries (although you could use other types of fruits) are lightly sweetened and then layered with a rich and creamy topping made with heavy whipping cream and Mascarpone Cheese. The first step in making Berry Parfaits is to combine the berries with a little sugar, which sweetens the berries and allows them to soften and release their juices. Once the berries have started to release their juices, we begin layering our parfaits. You can use long stem wine glasses, water glasses or any pretty glass. As I mentioned above, the 'cream' part of the recipe combines heavy whipping cream with Mascarpone Cheese, sugar, and vanilla extract. (Mascarpone Cheese (pronounced mas-kahr-POH-nay) is a thick, buttery-rich, delicately sweet and velvety, ivory-colored cheese. Its texture is similar to that of sour cream and it's often sold in plastic 8-ounce (225 gram) tubs that you can usually find it in specialty food stores and in the deli section of your local grocery store. But if you cannot find Mascarpone a good substitute would be an equal amount of regular cream cheese.) Then we simply place a scoopful of berries in each glass, followed by a dollop of cream and repeat the layers. If you have fresh mint on hand you can decorate each glass with a sprig and, if not serving immediately, cover and place in the refrigerator until serving time. Berry Parfaits: Place all the berries (cut the strawberries into bite sized pieces) in a large bowl and sprinkle with the sugar. Stir to combine and leave to macerate for about 15-30 minutes. 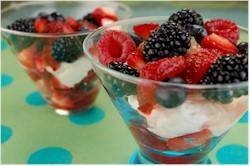 Take four wine or parfait glasses and layer the berries with the cream. Garnish with a sprig of fresh mint, if desired. If not serving immediately, they can be covered and stored in the refrigerator for several hours.